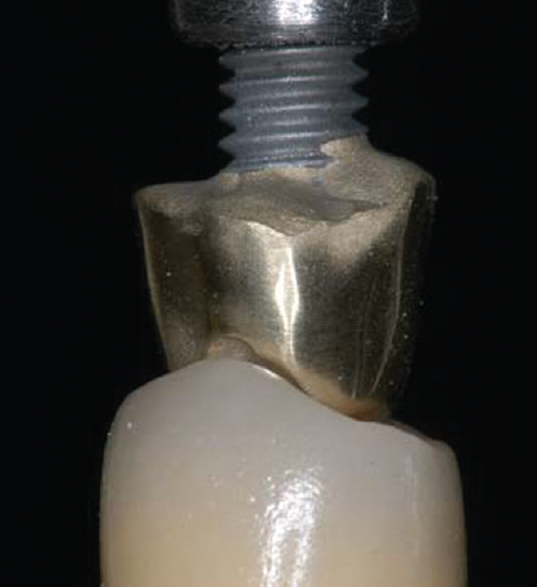 This study was designed to consider one variation factor: the fracture of the ceramic crown after mechanical fatigue. During the mechanical test, the loading rod tip simulated the occlusal contact between teeth that occurs in clinical conditions during the masticatory function. Four ceramic systems were used to verify the strength of the crowns after submitted to mechanical fatigue [Table 1]. After water storage in an incubator at 37°C for 24 h, the specimens were submitted to mechanical fatigue in an MCM apparatus (MCM tester; Sao Carlos, SP, Brazil) calibrated to operate at 60,000 cycles/2 Hz and load of 30 N exerted on the occlusal surface of the crowns immersed in distilled water at 37°C. In each cycle, five individual samples were submitted simultaneously to the mechanical fatigue. The tip of the steel rod used in the mechanical fatigue was made according to the occlusal morphology of the ceramic crown in order to establish a similar relationship that occurs in intraoral occlusion [Figure 1]. 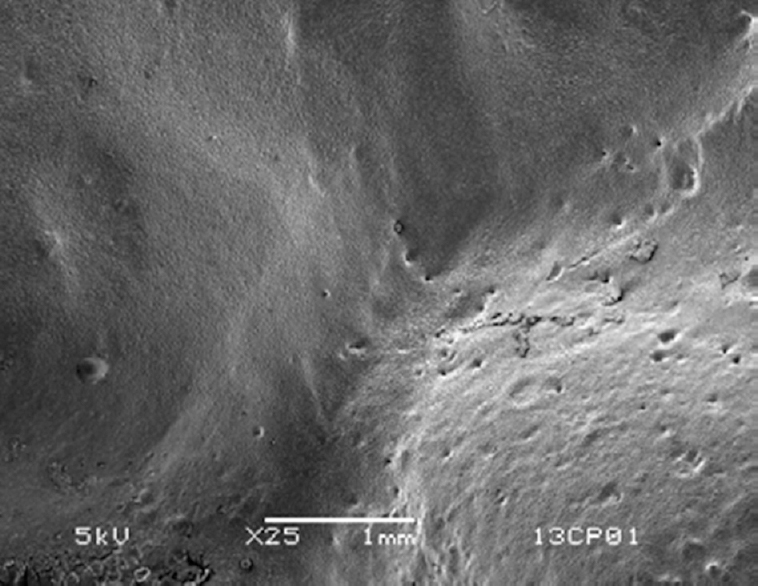 Scanning electron microscope (SEM) images of the ceramic crown occlusal surface after mechanical fatigue were obtained from epoxy resin replicas (Coating resin; Alec Tiranti; London, UK) gold coated under high vacuum (Balzers, SCD 050, Germany) and analyzed in MEV (LEO 435 VP; London, UK). The images were captured in all groups after mechanical fatigue. This procedure aimed to verify if the mechanical fatigue promoted damages to surface ceramic crown (abrasion and microcracks) that could previously compromise the strength of the crowns. Since this situation was not observed in any experimental group, only one representative image was considered in the manuscript [Figure 2]. Mitov G, Anastassova-Yoshida Y, Nothdurft FP, von See C, Pospiech P. Influence of the preparation design and artificial aging on the fracture resistance of monolithic zirconia crowns. J Adv Prosthodont 2016;8:30-6. Studart AR, Filser F, Kocher P, Gauckler LJ. Fatigue of zirconia under cyclic loading in water and its implications for the design of dental bridges. Dent Mater 2007;23:106-14. Wiskott HW, Nicholls JI, Belser UC. Stress fatigue: Basic principles and prosthodontic implications. Int J Prosthodont 1995;8:105-16. Kelly JR. Clinically relevant approach to failure testing of all-ceramic restorations. J Prosthet Dent 1999;81:652-61. Potiket N, Chiche G, Finger IM.In vitro fracture strength of teeth restored with different all-ceramic crown systems. J Prosthet Dent 2004;92:491-5. Guazzato M, Albakry M, Ringer SP, Swain MV. Strength, fracture toughness and microstructure of a selection of all-ceramic materials. Part I. Pressable and alumina glass-infiltrated ceramics. Dent Mater 2004;20:441-8. Taskonak B, Sertgöz A. Two-year clinical evaluation of lithia-disilicate-based all-ceramic crowns and fixed partial dentures. Dent Mater 2006;22:1008-13. Abou-Madina MM, Özcan M, Abdelaziz KM. Influence of resin cements and aging on the fracture resistance of IPS e.max press posterior crowns. Int J Prosthodont 2012;25:33-5. Attia A, Kern M. Fracture strength of all-ceramic crowns luted using two bonding methods. J Prosthet Dent 2004;91:247-52. Strub JR, Beschnidt SM. Fracture strength of 5 different all-ceramic crown systems. Int J Prosthodont 1998;11:602-9. Bulbule N, Motwani BK. Comparative study of fracture resistance of porcelain in metal ceramic restorations by using different metal coping designs- an in vitro study. J Clin Diagn Res 2014;8:ZC123-7. Quran FA, Haj-Ali R. Fracture strength of three all-ceramic systems: Top-ceram compared with IPS-Empress and In Ceram. J Contemp Dent Pract 2012;13:210-5. Oilo M, Kvam K, Gjerdet NR. Simulation of clinical fractures for three different all-ceramic crowns. Eur J Oral Sci 2014;122:245-50. Baladhandayutham B, Lawson NC, Burgess JO. Fracture load of ceramic restorations after fatigue loading. J Prosthet Dent 2015;114:266-71. Turk AG, Ulusoy M, Yuce M, Akin H. Effect of different veneering techniques on the fracture strength of metal and zirconia frameworks. J Adv Prosthodont 2015;7:454-9. Drummond JL, King TJ, Bapna MS, Koperski RD. Mechanical property evaluation of pressable restorative ceramics. Dent Mater 2000;16:226-33. Altamimi AM, Tripodakis AP, Eliades G, Hirayama H. Comparison of fracture resistance and fracture characterization of bilayered zirconia/fluorapatite and monolithic lithium disilicate all ceramic crowns. Int J Esthet Dent 2014;9:98-110. Nordahl N, Vult von Steyern P, Larsson C. Fracture strength of ceramic monolithic crown systems of different thickness. J Oral Sci 2015;57:255-61. Yucel MT, Yondem I, Aykent F, Eraslan O. Influence of the supporting die structures on the fracture strength of all-ceramic materials. Clin Oral Investig 2012;16:1105-10. Al-Wahadni AM, Hussey DL, Grey N, Hatamleh MM. Fracture resistance of aluminium oxide and lithium disilicate-based crowns using different luting cements: An in vitro study. J Contemp Dent Pract 2009;10:51-8. Al Bakkar H, Spintzyk S, Schille C, Schweizer E, Geis-Gerstorfer J, Rupp F, et al. Influence of a bonding agent on the bond strength between a dental co-cr alloy and nine different veneering porcelains. Biomed Tech (Berl) 2016;61:509-17. Hsueh CH, Luttrell CR, Becher PF. Analyses of multilayered dental ceramics subjected to biaxial flexure tests. Dent Mater 2006;22:460-9. Kim SY, Choi JW, Ju SW, Ahn JS, Yoon MJ, Huh JB, et al. Fracture strength after fatigue loading of lithium disilicate pressed zirconia crowns. Int J Prosthodont 2016;29:369-71. Aboushelib MN, Feilzer AJ, Kleverlaan CJ. Bridging the gap between clinical failure and laboratory fracture strength tests using a fractographic approach. Dent Mater 2009;25:383-91. Anusavice KJ, Shen C, Rawls HR. Phillips' Dental Materials. 12th ed. St. Louis: Saunders; 2013. Rues S, Schwindling FS, Meyer A, Rammelsberg P, Schmitter M. Fracture resistance of zirconia-based all-ceramic crowns after bur adjustment. Eur J Oral Sci 2017;125:310-3. Dong XD, Wang HR, Darvell BW, Lo SH. Effect of stiffness of cement on stress distribution in ceramic crowns. Chin J Dent Res 2016;19:217-23. Campos F, Valandro LF, Feitosa SA, Kleverlaan CJ, Feilzer AJ, de Jager N, et al. Adhesive cementation promotes higher fatigue resistance to zirconia crowns. Oper Dent 2017;42:215-24. Rohr N, Märtin S, Fischer J. Correlations between fracture load of zirconia implant supported single crowns and mechanical properties of restorative material and cement. Dent Mater J 2018;37:222-8. Vahey BR, Sordi MB, Stanley K, Magini RS, Novaes de Oliveira AP, Fredel MC, et al. Mechanical integrity of cement – And screw-retained zirconium-lithium silicate glass-ceramic crowns to Morse taper implants. J Prosthet Dent 2018;120:721-31.